I recently had the pleasure of sitting down with Andrea Machetti, the Managing Director for the Brunello di Montalcino producer, Mastrojanni. Andrea, thank you so much for joining me today. Before we dive in, let’s get some background. To start from the beginning, G. Mastrojanni bought the vineyards in 1975 and planted the estate, is that correct? Prior to that it was woods and fields. No vineyard land at all? That’s correct Giovanni. In 1975, the estate was acquired originally. Mastrojanni is located close to the village of Castelnuovo dell’Abate, in the eastern most part of the hills where the town of Montalcino sits atop. In 1975 that area was totally wild: only woods and meadows. Andrea, your winemaker is Maurizio Castelli who has a long list of respected wineries on his resume. Let’s talk about his preference for using oak in wines. The over oaking of many Brunello is a subject that is very contentious with some wine lovers. What attitude does he have toward notes of oak in Brunello? Does he feel that Sangiovese needs or benefits from extended oak aging? Good question Giovanni. The answer is, this is half techical, and half philosophical. The tannins of the Brunello grape (all Brunellos) are so strong that it has to age in wood. 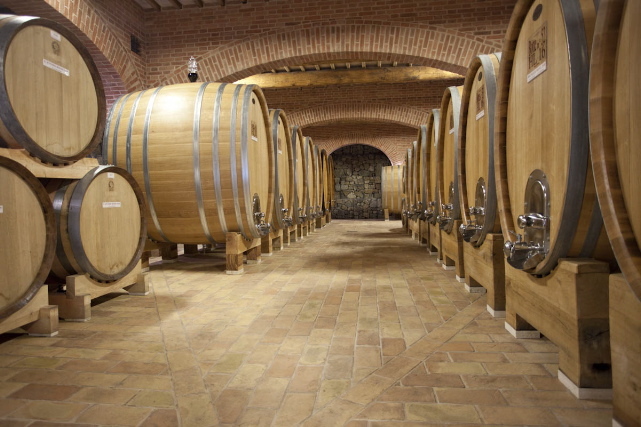 Oak aging is mandated at a certain level by DOCG law. At Mastrojanni, we age our Brunello in oak botti for 3 years. So a light oak flavour is naturally part of its range of its flavours. What is definitely important to us is that our Brunello must have the flavour of the Sangiovese grown in Castelnuovo dell’Abate, not a chocolate or vanilla or licorice liquid with a touch of grape flavour! I am thrilled to hear you say that my friend. Chocolate and vanilla characteristics in wine are not appealing to me. Those traits can be found in almost any wine. They mask terroir. Yes, they do. This is why I say, the wine must taste like Sangiovese grown in Castelnuovo dell’Abate. We don’t want to create a wine that appears as though it is from anywhere in the world. 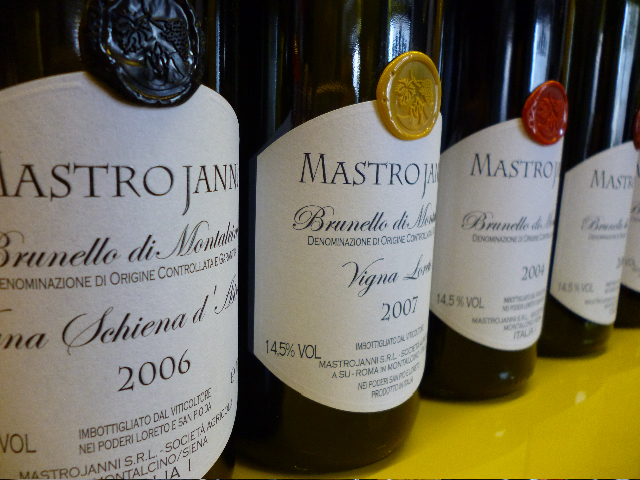 You craft three different Brunello at Mastrojanni. Are any of them aged in barrique or perhaps some combination of both barrique and botte? How do you feel that impacts the finished wine? We have always aged our Brunello in botti. Over the past few years we have begun reducing the capacity of our botti from the standard of 54 hl (which are in use anyway) to smaller capacities such as 33, 25 and 16 hl. Even these smaller sizes are not considered true barrique, which will only hold 200 liters. As a final sum, I repeat, the wood must only influence the flavour of the wine and never dominate the taste of our Brunello. Just as a point of reference for my readers, 16hl is approximately 400 gallons. A barrique would hold about 60 gallons, so the difference, especially at the larger barrel levels, is significant. I noticed on your website that you partially ferment your Brunello in both cement tanks and wood casks? What benefit do you see that the mixed fermentation provides? Cement and wood are totally different materials for fermentation. Cements main quality is to be totally inert. Completely neutral. It imparts no influence on the wine or what will become wine. Wood is more complex: the tannins of the wood immediately soften the tannins of the grapes and fix the colour of the juice. What do you mean by “fix” the color; to improve it or halt it from variation? The wood provides a “breathable barrier” – but it serves to maintain the color of the wine, to prevent completely, oxidation, and yes, degradation of colour. Open cement tanks don’t allow for that. Va bene, I see. So do you think that great wines are made in the cellar or in the vineyard? Is the role of the winemaker to be a minimalist or interventionist? Wine is always made in the vineyard, that’s all. And the greater the wine it is, the more true it is! Wherever in the world. The rest is something different. In 2008 Gruppo Illy, the famous coffee company, bought Mastrojannni. How have things been since the Illy acquisition? Was the transition difficult? Has there been any major change in the winemaking operations as a result of the acquisition? No changes have been introduced: this is confirmed by the fact that the technical staff has remained the same. Andrea Machetti, the managing director, Maurizio Castelli (consultant enologist), Piero Ferretti in the cellar. They were all here before the acquisition and they are all here today. The team is committed! Do Maurizio and Andrea run the estate with no intervention from ILLY? How significant a role does Andrea play now? Illy is not involved at all in the direction of the wine making. Andrea is the chief of agronomy, wine making and sales. He is the heart and the brain of Mastrojanni. Maurizio Castelli cooperates and consults with Andrea Machetti since 1992. They are very good friends, but he is a consulting enologist only. They run the estate independently, but are ultimately owned by Gruppo ILLY. The results are showing for certain. Over the past year, I’ve had the 2009 Rosso di Montalcino a few times and it’s one of the best Rosso di Montalcino I’ve ever had. Bravo! It’s graceful and brilliant – it has finesse and such pure fruit. What makes that wine so special? I see on your website the Brunello Vigna Loreto. Is this a new wine with the 2007 vintage? What made you decide to bottle it separately? It depends on the vineyard: Loreto is not an old vineyard. The Loreto was planted in 1999 and 2007 is the first vintage of its full maturity. The Vigna Loreto is 1.5 ha of “tufo” (sandy stone) and round stones left by the Orcia river with complete easterly exposure. Andrea Machetti decided to plant 9 different clones of Brunello thereby combining with the specific qualities of the soil. It seems from this first vintage that he was right! And with that easterly facing, the grapes are exposed to less hours of intense sun, yes? Meaning, they are ultimately fresher and with slightly higher acidity? Si, that is correct. It yields livlier wines, fresher and also more floral and aromatic Brunello. But also elevation matters in this, not just exposure. In addition to the Loreto, you also produce another single vineyard Brunello called: Schiena d’Asino. Are they both imported to the US? Who is your US importer? Yes, of course they are both imported to the US. Being that the USA is such a big country, we have 11 different importers. In NY/NJ we are handled by Selected Estates of Europe based in Mamaroneck, NY. Tre Brunello: The Estate marked with red wax, the Loreto with Gold, and the Schiena d’Asino with black. A few years ago, Castello Banfi completed an exhaustive study on clonal research and how it effects Brunello and their vineyards. Has Mastrojanni benefitted from this research? Is it widely known in Montalcino? I have heard of the studies, but I do not know if the results of these studies have become public or not. All the best named wineries have made studies like those for their newer vineyards. 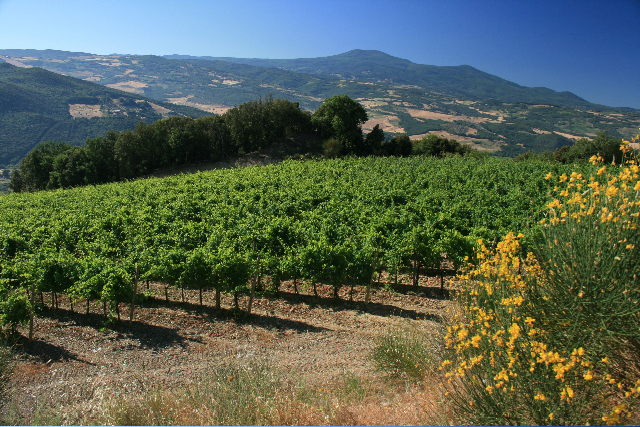 For us the real matter is that the Brunello vines are so sensitive to different soils and exposures that these studies are almost impossible to be replicated in different areas. That makes sense – if specific terroir is to be believed, that makes perfect sense. I liked this comment on your website: “It is clear that a winemaker is like a doctor, and he has to know when there is a problem and how to cure it. His trick, like that of the best doctors, is “prevention”. Or rather working in a preventative fashion, through a careful and continuous presence in the winery in order to protect the wine from any possible “colds” that might attack it.” So you’re employing the most natural of winemaking processess? What things are done in the winery as a result of this methodology? The environment is our most important partner in producing great grapes. We are not bio – something. We simply try to use our best common sense and the lessons that come from our years of experience and tradition. Sometimes doing little is the most important thing. This is like what you asked before about interventionism. One must be careful. It is through experience that you can come to prevent mistakes, and to understand what conditions they can occur in. I’m sure you’re aware of the disaster that befell Soldera. That is a shame for the town of Montalcino. How has that impacted the area? Is this something you’re concerned about? I must correct you Giovanni; it has not been a shame for Montalcino. It is a shame for Soldera. The Police are still investigating what happened. At the moment it seems it was a private fact that has happened in Montalcino to one of our most representative producers. For sure, there has been a problem in communicating what happened, but it remains a private fact between Mr. Soldera and one of his ex-employees. It is a shame for sure, but not for the entire town. What is your most challenging wine to produce? The dessert wine, Boytrs passito, must be among them, no? Botrys is our Moscadello di Montalcino Vendemmia Tardiva. Most customers do not know that the Moscadello is the wine that had made Montalcino famous so many years before the Brunello became among the most known wines in the world. Just by its nature – noble rot affecting grapes, it is always a challenge. But each wine at any given time may be difficult considering the vagaries of each vintage. Too hot, not enough rain, too much rain. It can change quickly. What challenges are facing Mastrojanni today? What excites you most about the future for your estate? The real great challenge of the coming years is the global warming. Winters and springs are getting dryer and dryer while summers are getting hotter and hotter. Sensitive vines like Brunello are suffering from these changes. We are changing the way we grow the vines regarding ways to balance sugar/alcohol and freshness/acidity. We are looking at the way we green harvest, manage canopies, etc. In the next couple years we will see if we have been more or less right. It’s true Giovanni. It starts as a very simple thing. This last question is a tradition of all my interviewees: When all the work in the cellar and the vineyards are done, what does Maurizio uncork when he goes home for the night? After spending the whole day tasting so many different wines and blending, water only! Of this I am sure! Va bene – Andrea, grazie tanto for your time. 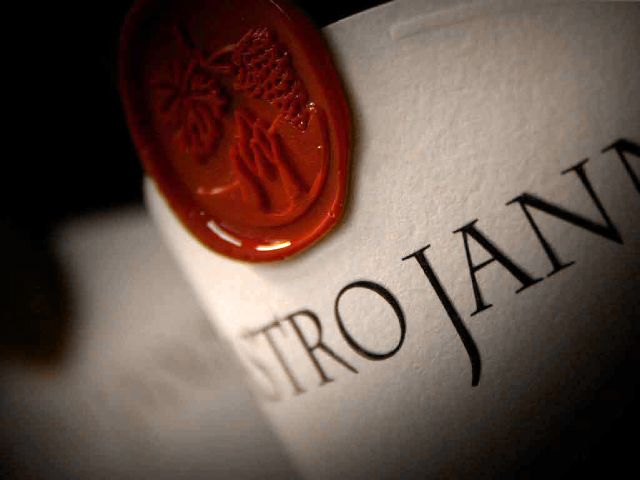 I look forward to tasting more of Mastrojanni’s wines and will surely let you know of my results! Prego Giovanni – I will be following for sure. Thank you Andrea Guerrini and John! Great info, questions, and answers. I haven't seen these wines, but when I do . . .
John, you amaze me! Wonderful interview! Grazie amico! Lots more coming, stay tuned. Thanks for the comments as always. If you need help finding the distributor in your area, just let me know. Some of the best interviews I've had the pleasure or reading. Bravo! Thanks so much and thanks for all your other comments too. I appreciate the feedback and hope you continue to enjoy and spread the word! I am a big fan of Mastrojanni wines, and Marizio Castelli's wines, so I am grateful for your interview. My respect for this estate and their owners continues to grow. Thanks! Thank you for checking us out! I agree, I find a lot of amazing Brunello that I later discover are made at the hands of Maurizio.